Lesléa Newman is the author of more than sixty books for children and adults, including October Mourning: A Song for Matthew Shepard. A former poet laureate of Northampton, Massachusetts, she lives in Holyoke, Massachusetts. Laura Cornell has illustrated many books for children, including the best-selling picture books by Jamie Lee Curtis. She lives in New York City. The author’s text is simple yet powerful in its ability to move readers of all ages. Cornell’s fluid watercolor and gouache illustrations breathe life into this delightful story. Each page is artfully and distinctly rendered to be a visual depiction of the beauty and joy of diversity.... Readers will be warmed by this glimpse into Heather’s family, whether revisiting the text or experiencing it for the first time. The details are different, but the nontraditional-ness is held in common. Though a quarter of a century has passed, the book holds up well. With new illustrations and a slightly revised text, it remains a charming, sweet-spirited story that still fills a need...Newman and her new illustrator Cornell deserve kudos for bringing fresh life to this standard title. 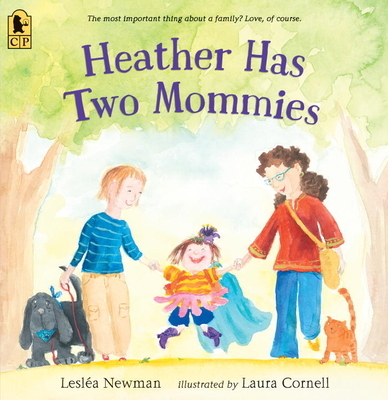 Now a modern classic, the children’s book “Heather Has Two Mommies” is the perfect Mother’s Day book, times two.